Love the texture of this geometrical vase. While it is rectangular in shape, there is a pleasant curve to the surface which makes it an unusal and attractive shape. Love it! Uttermost's Accessories Combine Premium Quality Materials With Unique High-style Design. With The Advanced Product Engineering And Packaging Reinforcement, Uttermost Maintains Some Of The Lowest Damage Rates In The Industry. Each Product Is Designed, Manufactured And Packaged With Shipping In Mind. 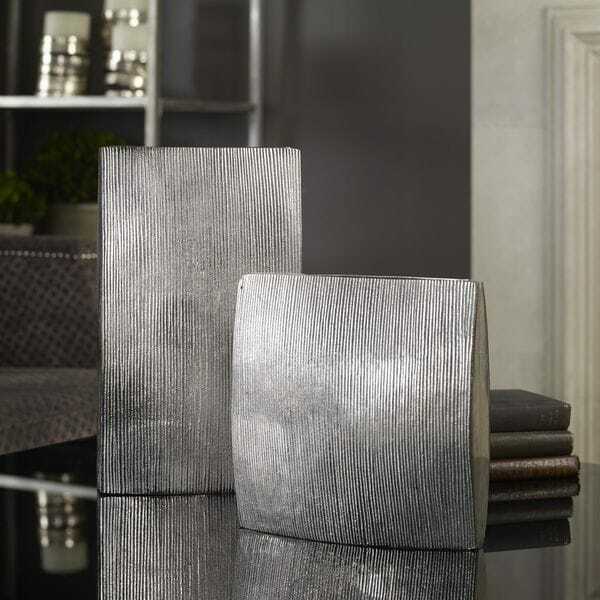 Cast Of Aluminum, These Handcrafted Vases Feature A Ribbed, Polished Nickel Finish. Sizes: Sm-8x8x3, Lg-7x12x3 Cast Of Aluminum, These Handcrafted Vases Feature A Ribbed, Polished Nickel Finish.